One of the more challenging decisions you may be faced with is when to bug out. A lot of us who consider ourselves seasoned preppers with a good number of survival skills might be tempted to wait until the last minute because we’re not convinced the situation is so dire that we couldn’t survive. Also, admit it, we don’t want to look foolish in front of our friends and neighbors if the crisis turns out to be a big, fat nothingburger. However, if any of the following scenarios are a part of your life, it would be prudent to be in that first wave of people heading out of town. You have a loved one with special needs. Recently I became acquainted with a middle-aged, single lady who lives with her elderly parents. Her father has dementia and her mother has mobility and health issues. She, herself, uses a CPAP machine. I wondered if this family would make it if they ever had to evacuate their home or city, as they live deep in hurricane country. Packing up medical equipment, remembering which prescriptions to pack (and then getting refills if necessary), and helping elderly and ailing loved ones into a vehicle is going to take time, along with energy and physical strength. If you are prepping with special needs family members, you need to read this series of articles over on The Survival Mom blog. There’s a baby in the family. Similar scenario. When I think of the road trips we took when our kids were little, the logistics were nearly mind-boggling. The strollers, toys and other diversions, the travel cribs, diapers, breast-feeding paraphernalia, blankets, clothes and then even more clothes — the list goes on and on. You can’t fully pack what you need to evacuate when you have an infant unless you have plenty of time. In that case, start your bug-out prepping a few days before you think you might actually need to leave. You can read more about prepping with babies here. You have kids. Infants or not, kids are going to slow you down, guaranteed. When they’re little, they won’t be able to find their left shoe or they have a meltdown because it’s time to watch Sesame Street. When they’re older, they’re going to argue and question everything — why do we have to leave now? Can I take my best friend? I have to text my girlfriend/boyfriend first. And on and on and on. Then, once you hit the road, there will be frequent potty stops, “You need to burn off some of that energy” stops, and before you know it, you’ve been on the road 8 hours and have driven only 100 miles. So, yes. If you have kids, plan on bugging out at least a couple of days earlier than you might otherwise. You have nowhere to go. Think about it. If you wait too long to evacuate, you’ll be competing with thousands of other people for scarce hotel rooms, campsites, etc. If you don’t have any bug out location in mind, and let’s face it, that applies to most preppers, then by getting out on the road early you’ll have first dibs at the best locations. (By the way, take a look at sites like Airbnb and Vacation Rentals by Owner for places to stay in a pinch. Both require deposits of varying types and dollar amounts, but if you really do have nowhere else to go and don’t care to live out in the wilderness with the wife and all the kids, these might be a much better option.) This book, by The Survival Mom, has a list of some very creative bug-out location options and expert advice for planning an evacuation. There’s a chance you may not be able to return for a very long time. In this case, you’ll need time to pack several month’s worth of supplies. Not necessarily months worth of food — you can buy more wherever you’re headed, but you’ll want to pack clothes for different seasons, maybe homeschooling supplies, and important documents (marriage license, professional resume/certifications for future employment, medical records, birth certificates, insurance policies, financial papers, etc.). You may also want to liquidate such things as insurance policies, retirement funds, and investments, and possibly sell things to add to your cash stash. Wherever you end up, you’ll need funds to survive until you can get another job. All this is going to take a good deal of time, so once you’ve made the decision that you’ll need to leave and may be gone for many weeks, get started and then move out. You have pets and/or livestock to care for. On one cross-country move we had 4 cats and an elderly incontinent dog with us. Good times. It wasn’t easy to find hotels that were THAT pet friendly, and we had to make sure we packed their food, water/food dishes, disposable litter boxes, and litter. Abandoning our animals is unthinkable — first, I’d have to fight off the kids and wife, but second, and more importantly, those animals then become someone else’s problem, and that isn’t fair to anyone. If you have animals to consider, then you need to make those plans and preps right now to either take them with you or find somewhere for them to stay until the emergency has passed. You’re going to be part of a larger caravan. The more people who are involved in anything, the more likely there will be delays. We learned this with a sports team carpool recently. All it took was for one kid or one parent to wake up a few minutes late or unable to find their uniform to make the whole lot of us to arrive late to practice. This truth is going to be multiplied exponentially when your group is under extreme duress. This bugging out isn’t a rehearsal — it’s the real deal. You can bet a paycheck that once adrenaline sets in, some won’t be thinking straight, mistakes will be made, arguments over minutiae will slow everything down. So, as soon as you and yours are all set to go, head over to the group’s meet-up place, even if you arrive a few days early. 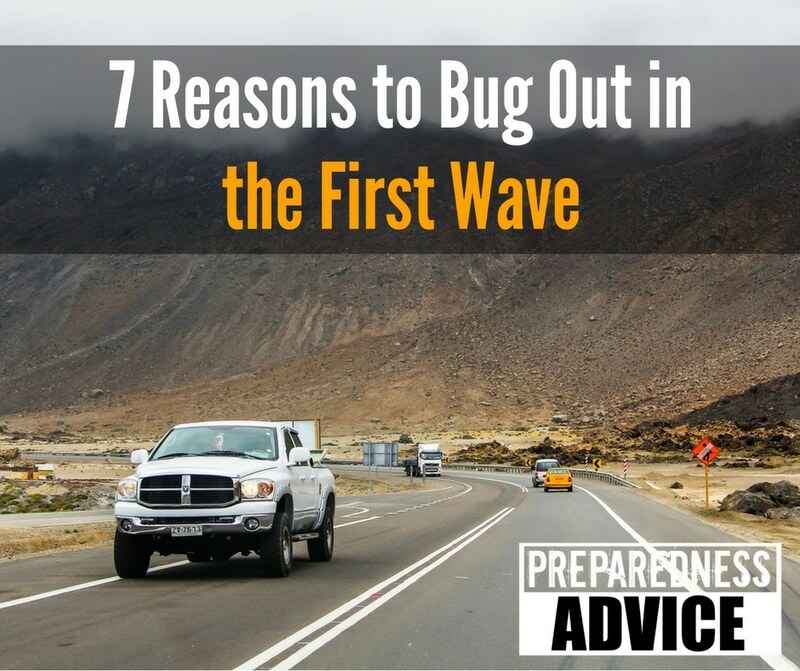 As always, the big question is, “How do you know when it’s time to bug out?” You may want to head over to our partner blog, The Survival Mom, and read this series of articles about when to know it’s time to bug out, as adviced by folks such as Jim Cobb, James Rawles, Claire Wolfe, The Apartment Prepper, and a dozen or so others. This article by Howard Godfrey contains more good advice. This entry was posted in bugging out and tagged elderly, evacuation, family, health issues, kids, livestock, Pets. Bookmark the permalink. All good points. I’ve only questions when it comes to the basics – where and why. The first, if you’re lucky enough to actually have a location that can support life for a long-term, is simple. Is it really, can it support your life and those with you? Too many have a dream that will not bear up under the reality. All your factors ranging from babies, kids, special needs, animals…. and any others if you are in a group really really need to be considered. You’ll be leaving your normal stomping grounds and all the support structures and facilities you’re used to. Even if a place is swept virtually clean of supplies – take a big-box store in your locale as an example – you still know where it is, now and would after things get to going. You are aware of things you’ve seen but not considered (wire, lights, pipes, shelves and all the make-up of the place(s)). You leave your current area, all that minute info is useless. The ‘why’ aspect. Unless you’re in some truly deadly location, for the same reasons as in my ‘where’ query, you know of nowhere else so well as where you currently are. Then too, it is your’s, by possession and/or ownership, right at this moment. Can you walk/drive away and not wonder if you could’ve held on? If you are unwilling to fight now, what’s going to change due to a move to an auxiliary location within you? If anything, for much the same causes – all those little ‘knowings’ of how things are in your current area will be lost, what you know is somewhere close by, and if not near after a crisis you’ll be putting yourself at a disadvantage. I agree, it may come time to run. But that is what it is. The cute phrasing of ‘bugging-out’ is analogous to fleeing. And once in flight, where you land will not be home physically, mentally or emotionally for a long time to come. You will be a refugee. Great info!! I’m one of those folks with a wife who has both mobility and medical issues. This makes prepping for “her” a sometimes daunting task, what to bring, how much(all of it?? )getting her in/out of house to vehicle and back again. Comfort food plays into that scheme as well…when depressed, she likes….you get the picture. Trying not to go moon bat crazy while getting it all in place… A great big THANKS for the info!!!!!!!!! For CPAP people-look into rechargeable power supplies. I’ve lost my home in the flood in Sept. I have recently rent a place but I want now to purchase a place to live off grid instead of waiting I’m alone and was Military .. how do I find someone that would want to join me to help one another.. I can’t seem to find any sites to solve my problem.. please help.. Try Survival Singles web site to find a partner for bugging in or out.